The Pecka Playscape is a unique set of play elements and installations on the boundary between sculpture and folly located at 1062 meters above sea level. The main impulse that initiated this project was to motivate both parents and children to enjoy the outdoors. To spend time in a forest while breathing fresh mountain air and to encourage them to be in contact with natural materials such as wood, water and stone. We designed all the playscape elements so that they are in harmony with the original landscape while keeping it almost intact. 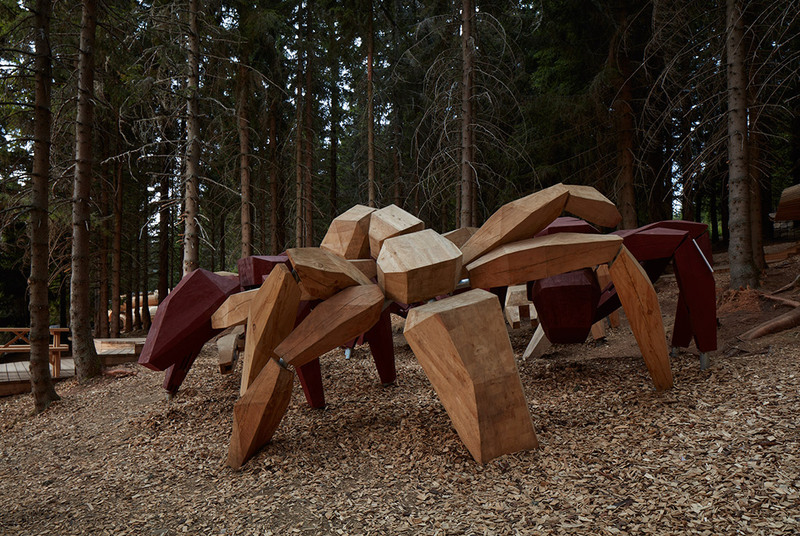 The installations were inspired by wildlife inhabiting the Krkonoše Mountains. The playscape is thematically divided into the “world in the trees” offering a walk along suspension bridges among the nests of black stork. The landscape then transforms into a ” world in a forest” where it is possible to crawl through a giant spindle conch (Cochlodina), giant viper, animal dens or to be a part of a fight between two species of ants and to drop a wooden ball through an anthill labyrinth. There is a giant lynx that lurks at the edge of the forest with an open mouth that could be climbed into and through to its body. On the meadow there is a fallen deer whose antlers and skeleton serve as a look-out tower and also could be used for climbing and sliding. Down on the meadow spring there sits a salamander whose back is a chute for sliding a wooden ball (“pecka”) down to its paws. From a formal point of view, elements of descriptive nature (e.g. lynx, viper) intertwine with more abstract items (e.g. deer, cochlodina). Each element has its own information panel displaying illustrations featuring educational content. The learning focus of the playscape covers different topics within the disciplines of natural science and physical education. The diversity in the way the different subjects are represented is paralleled by the varied levels of difficulty of the play elements. The playscape as a whole is a well-considered combination of certified play elements and sculpture installations that complement the character of the local world of wildlife. The designers are thus inviting parents to take part in the play of their offspring. The construction of the different installations is designed with respect to the environment in which they are placed. The choice of materials was guided by the altitude of one thousand meters above sea level and long winter seasons. Last but not least, the natural setting of the site in the protected landscape of Krkonoše National Park had to be taken into careful consideration. The installations are thus qualified as temporary, which is in most cases reflected in their foundations using ground screws. The prevailing material is larch timber connected with steel elements. Each installation is a kind of prototype. Pecka Playscape is not for wimps. Entering it means stepping into an adventure of your own. 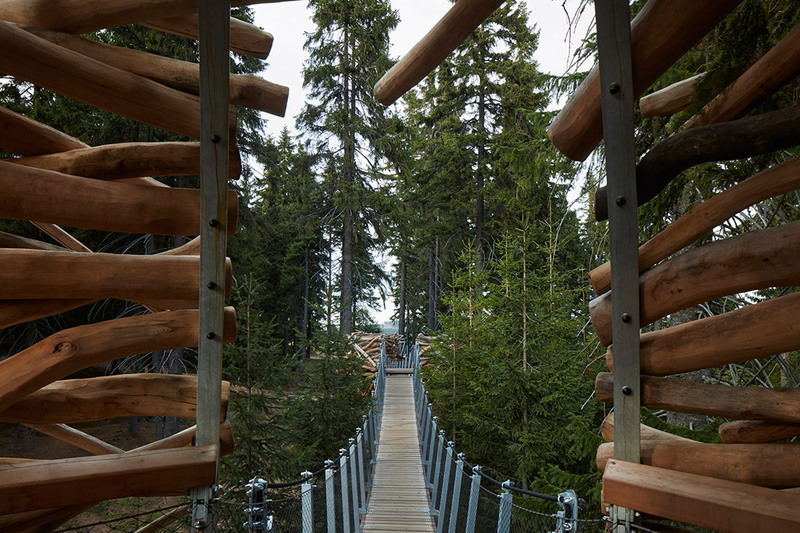 Pecka Playscape represents a fusion between a playground, a sculpture park and an educational trail, designed on a monumental scale and set in the midst of the enchanting landscape of Krkonoše National Park.